McNary’s defense thought North Salem’s 69-yard touchdown run on the Vikings second offensive play of the game was a fluke. The Celtics spent the rest of the night proving it. Behind two goal line stands, McNary defeated North Salem 28-7 at home on Friday, Sept. 1 to open the 2017 season. The Celtics reached the end zone on their first play from scrimmage as Lucas Garvey took a handoff from quarterback Erik Barker and ran 83 yards down the sideline to give McNary a quick 7-0 lead. After North Salem’s own big play, McNary took advantage of a muffed punt, recovered by senior Jakoby Doke. A 10-yard touchdown run by Junior Walling then gave the Celtics a 14-7 lead with 8:16 remaining in the first quarter. 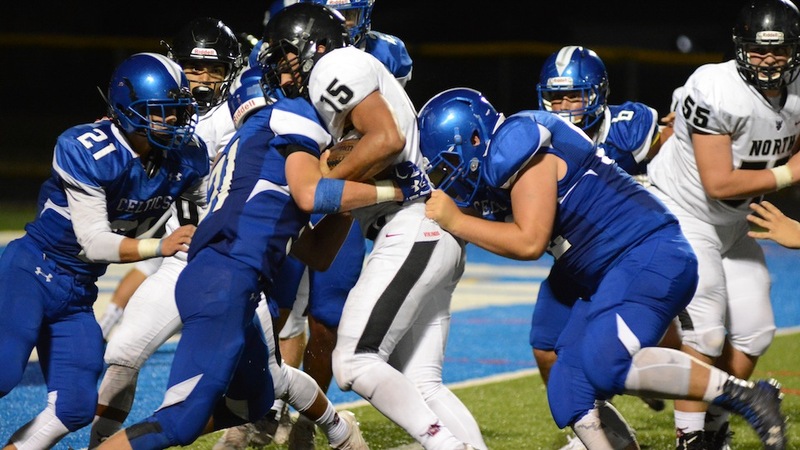 On third-and-goal from the 2-yard line, the Vikings had a chance to tie the game but defensive lineman Joshua Schmeltzer swallowed North Salem fullback Isaiah Alvarez at the 1-yard line. The Celtics then held strong again on fourth down. McNary’s offense was able to convert on fourth down. Facing a fourth-and-5 from the North Salem 35-yard line, Barker connected with Jacob Jackson for a 20-yard gain. After three run plays, Barker then found Jose Solorio in the end zone for a 6-yard touchdown to give the Celtics a 21-7 lead with 5:10 remaining in the first half. North Salem went right down the field to open the second half. But on fourth-and-goal from the 2-yard line, Walling knocked Vikings quarterback Zac Sullivan out of bounds short of the goal line. “Not all defenses can hunker down and take on a goal line stand, let alone two in the same game, against a team that wants to power the ball right at you,” Auvinen said. “They were looking at every gap and we had every gap squared away. We came through with low leverage and stonewalled them for four plays. Garvey, who led McNary on the ground with 171 yards on 22 carries, capped off an 11-play drive to complete the scoring on a 3-yard touchdown run with 8:26 left to play. Both Auvinen and offensive coordinator Brad Emmert thought the Celtics could’ve put more points on the scoreboard. Jackson caught five passes for 62 yards to lead the receivers. On defense, Jackson also had an interception and Doke recovered three fumbles. McNary travels to South Salem (0-1) next Friday. The Saxons lost to Sprague 58-12.